↑ "These Upanishadic ideas are developed into Advaita monism. Brahman's unity comes to be taken to mean that appearances of individualities. "; অনুবাদ: "ঔপনিষদ্‌ ধারণাগুলি ক্রমে ক্রমে বিকাশ লাভ করে অদ্বৈতবাদে পরিণত হয়। ব্রহ্মের একত্ব ব্যক্তির আত্মপ্রকাশের উপায় হিসেবে গৃহীত হয়।"
↑ "The doctrine of advaita (non dualism) has its origin in the Upanishads. "; অনুবাদ: "অদ্বৈতবাদের উৎস উপনিষদে নিহিত রয়েছে।"
↑ The breakdown of the Vedic cults is more obscured by retrospective ideology than any other period in Indian history. It is commonly assumed that the dominant philosophy now became an idealist monism, the identification of atman (self) and Brahman (Spirit), and that this mysticism was believed to provide a way to transcend rebirths on the wheel of karma. This is far from an accurate picture of what we read in the Upanishads. 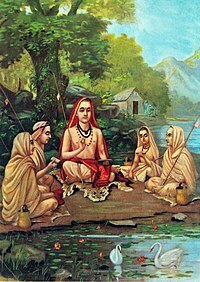 It has become traditional to view the Upanishads through the lens of Shankara's Advaita interpretation. This imposes the philosophical revolution of about 700 C.E. upon a very different situation 1,000 to 1,500 years earlier. Shankara picked out monist and idealist themes from a much wider philosophical lineup. ↑ In this Introduction I have avoided speaking of 'the philosophy of the upanishads', a common feature of most introductions to their translations. These documents were composed over several centuries and in various regions, and it is futile to try to discover a single doctrine or philosophy in them. ↑ The Upanishadic age was also characterized by a pluralism of worldviews. While some Upanishads have been deemed 'monistic', others, including the Katha Upanishad, are dualistic. ↑ The Maitri is one of the Upanishads that inclines more toward dualism, thus grounding classical Samkhya and Yoga, in contrast to the non-dualistic Upanishads eventuating in Vedanta. ↑ For instances of Platonic pluralism in the early Upanishads see Randall. ↑ The date of the Buddha's birth and death are uncertain: most early 20th-century historians dated his lifetime as c. 563 BCE to 483 BCE, but more recent opinion dates his death to between to between 486 and 483 BCE or, according to some, between 411 and 400 BCE. ↑ Max Müller, The Upanishads, Part 1, Oxford University Press, page LXXXVI footnote 1; Quote: "last chapters, parts of the Veda" & "object, the highest purpose of the Veda". ↑ See Henry Thomas Colebrooke (1858), Essays on the religion and philosophy of the Hindus. London: Williams and Norgate. In this volume, see chapter 1 (pp. 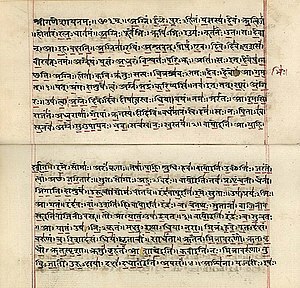 1–69), On the Vedas, or Sacred Writings of the Hindus, reprinted from Colebrooke's Asiatic Researches, Calcutta: 1805, Vol 8, pp. 369–476. A translation of the Aitareya Upanishad appears in pages 26–30 of this chapter. Max Müller, translator, The Upaniṣads, Part I, New York: Dover Publications, Inc., 1962, আইএসবিএন ০-৪৮৬-২০৯৯২-X. Max Müller, translator, The Upaniṣads, Part II, New York: Dover Publications, Inc., 1962, আইএসবিএন ০-৪৮৬-২০৯৯৩-৮.